Opening Reception: Saturday March 9th, 12-10pm. pt. 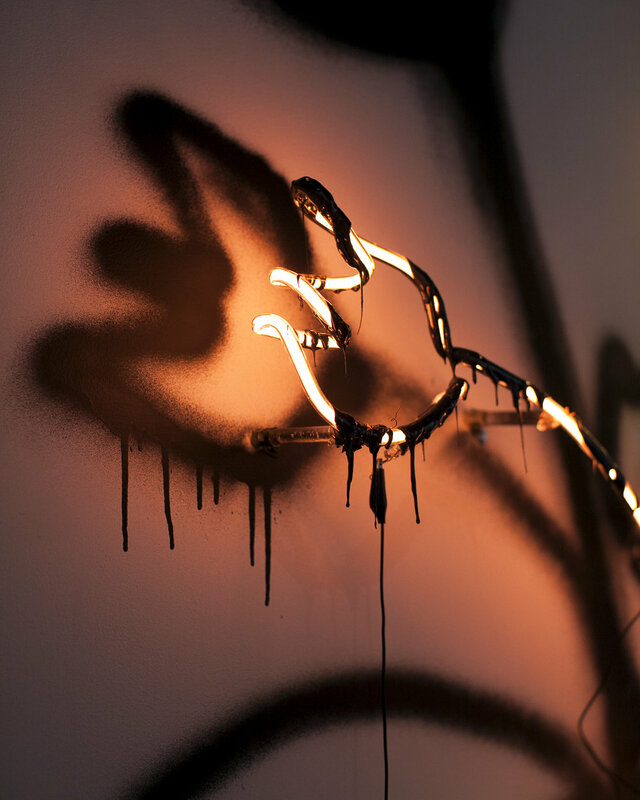 2 Gallery is proud to present Not Long For This World, a solo exhibition by Oakland-based sculptor Meryl Pataky. Simultaneously reflecting on her own childhood and desire for motherhood, Not Long for This World is a dystopian exploration of domestic life, our children, and our future. 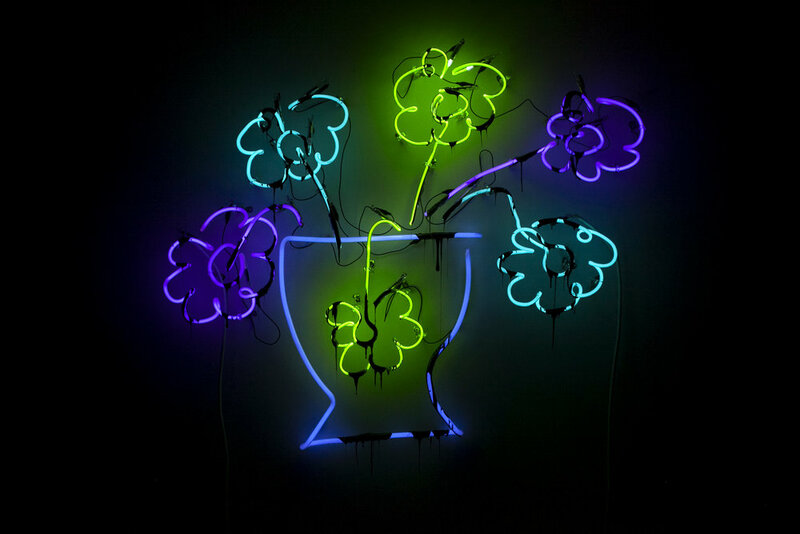 Childlike flowers glow, drip, and melt into the gallery in both neon and paint, playing with light reflection and color on the walls’ surface before completely disappearing into the black carpeted floor. 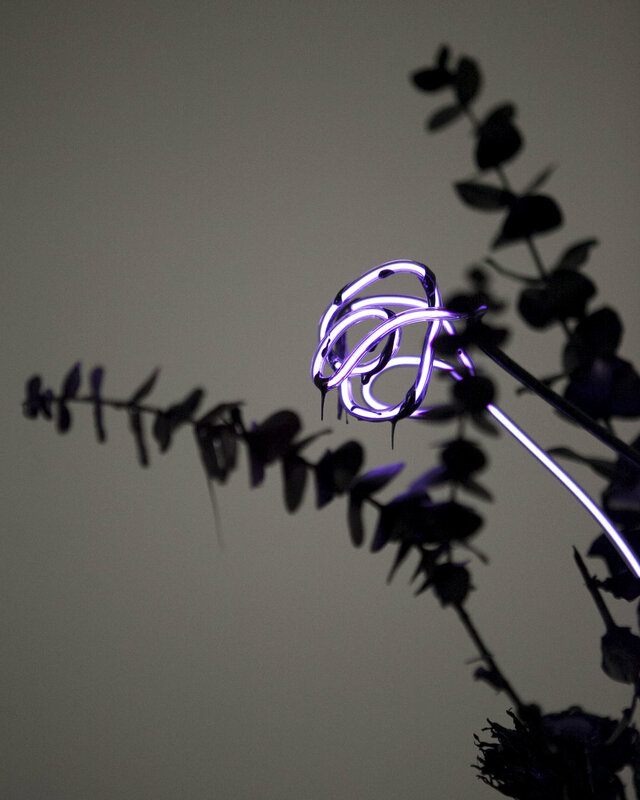 Instead of LED lamps, this “home” glows with bright greens, purples, and blues, overlaid with a sense of depreciation, suggesting the passage of time. 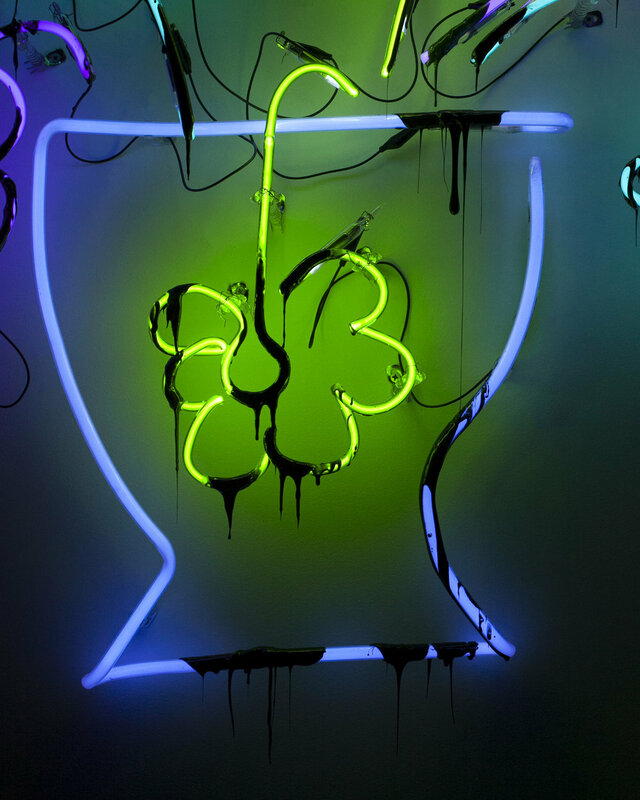 Using her tar-dripping techniques, these works speak to what happens after the transformer dies, what happens after the power goes out, and what might happen to us as well. This creates a tenuous balance, making us hyper-aware of passing time while drawing our attention to sensuous materials. According to the UN, we only have 12 years until we begin to experience catastrophic effects of climate change, so Pataky consciously uses plastic, glass, and other unsustainable materials, urging us to consider the future of our planet and how much actual time we have left. Not Long for This World is a celebration of anxiety, with Pataky fully embracing these precarities. As a child, was put up for adoption and at 24, she lost her adoptive mother, both of which compound her own self-doubt regarding motherhood. 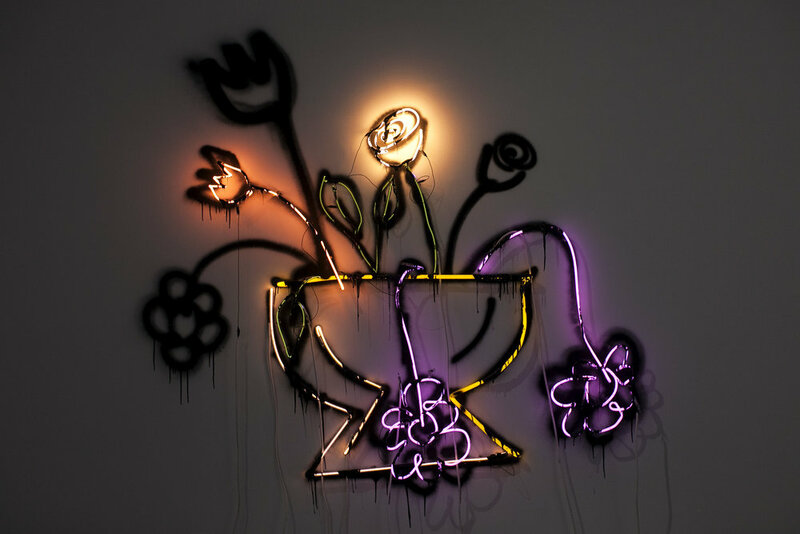 By drawing flowers, something she did as a child, and then creating them in both neon and paint, she evokes her own history while growing into her future as an artist. 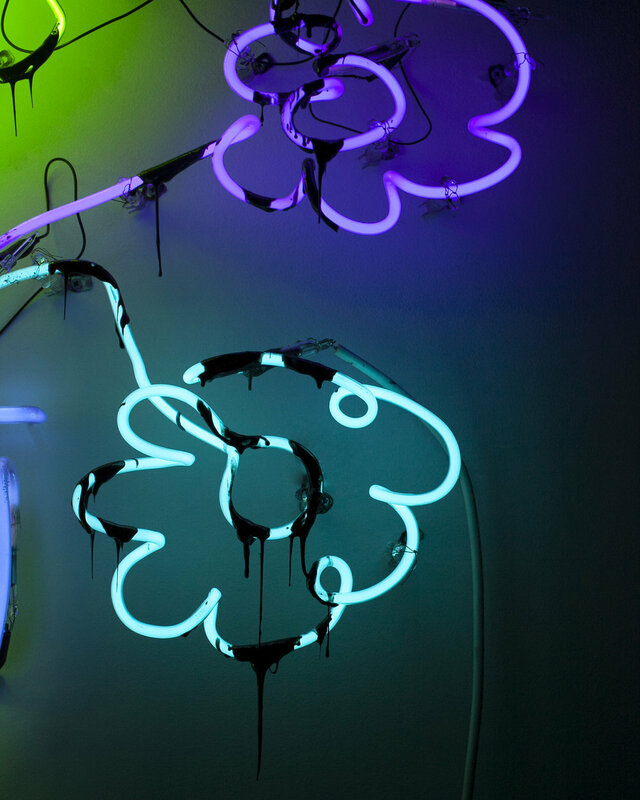 Having always longed for a more organic process, she moves away from the structure of neon to the intuitive nature of painting. In this body of work, Pataky imagines domesticity in a sincere and exciting way, breaking boundaries, using vibrant color, and addressing reality directly. This honest reflection on thoughtful parenthood, creating life in 2019 and the weird and wonderful adaptations that must accompany it. Not Long for This World asks us to revel in our anxieties and acclimatize to what may be on the horizon for us all, whether we like it or not. Article by Anna Volpicelli published in the San Francisco Chronicle on March 5th, 2019.